The scene: The Ale House at Amato’s is the logical conclusion of Denver’s quarter-century love affair with all things beer. In 1988, citizen John Hickenlooper fought to change state law and succeeded in opening Colorado’s very first brewpub here, the Wynkoop brewery. Denver has been obsessed with beer ever since. Hickenlooper’s resulting popularity helped propel him into public office, first as Denver’s mayor, and currently as Colorado’s governor – the first brewer turned governor since Samuel Adams in 1793. Today Denver is chock full of breweries and beer pubs, and more than 200 new taps were added last year alone. There are over 60 breweries in the hopped-up triangle of Denver, Boulder and Ft. Collins, including Coors, the world’s largest. More than 200 different varieties are brewed here, the city is home to the Great American Beer Festival, listed in the Guinness World Records as the world’s largest, and the greater Denver metro area brews more than any other U.S. city. So visitors seeking a taste of Colorado have plenty of choices, but few better than The Ale House at Amato’s. A cooperative venture between the Wynkoop and Breckenridge breweries, two of Colorado’s most popular, the offerings are far from limited to their products. Amato’s occupies a large modern building in the Lower Highlands neighborhoods with stunning views of the downtown Denver skyline. It also sports a cozy open-air rooftop bar, complete with fireplaces, which is jammed in warm weather and open on mild weekends even in winter. The main floor includes a large central bar surrounded by tables and a separate large dining room, and there is a third bar upstairs. The setting is simple and a bit corporate, not unlike a Chili’s or Applebee’s, but the food and drink offerings are anything but. In celebration of all things beer, they have 42 small producer varieties on tap daily, including around 30 craft beers made in Colorado, plus rotating out-of-state “guest” versions. They have Colorado-made hard cider on draught, even local wine from Denver’s favorite urban winery, along with two true hand-pulled cask-conditioned ales, an old English tradition that is becoming hard to find even in England. But since no beer is actually made on the premises, the focus is on food – and lots of it. 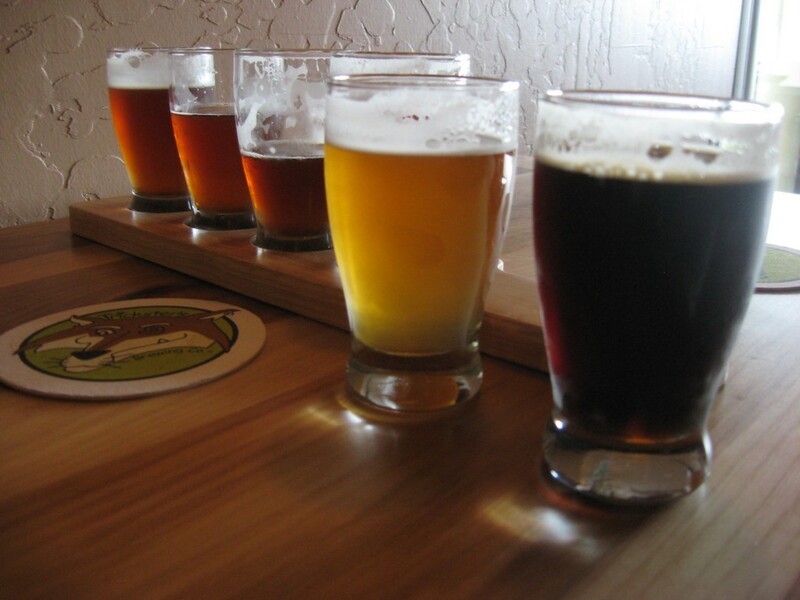 Reason to visit: Wild boar sliders, ½ pound burgers, fried brownies, flights of Colorado beers. The food: The term is a bit overused and vague, but the menu at Amato’s is best described as “gastropub,” with higher quality takes on simple comfort foods. These dishes feature eclectic and sometimes luxurious upgrades, like goat-cheese croquettes added to salads and lobster macaroni and cheese. Pork chops feature sautéed apples in a brandy cream sauce. Wild game, a Colorado Rocky Mountain culinary signature, is widely used, and the most popular appetizers are the trio of wild boar sliders and the elk sausage platter. The former is misleading with the biggest “sliders” I’ve ever seen, really just small burgers, and if you don’t share, this app is easily an entree. This is characteristic of the portions at Amato’s, which are hearty to say the least. I guess they are called sliders in comparison to the regular burgers, all of which weigh in at a hefty half-pound, and choices abound, including lamb, wild boar, and plain old beef, plus myriad toppings. The signature Amato Burger has roasted red peppers, sautéed spinach, fresh mozzarella, and garlic mayo, and is served on a ciabatta roll. The menu is vast, and in addition to the burgers there are large entrees, like pork chops with a full complement of sides, soups, sandwiches (slow-smoked, barbecued pulled pork is another nod to local cuisine) and entree salads, available in myriad combinations. Amato’s also serves more traditional pub fare like meatloaf, fish and chips, ale-battered shrimp and chicken pot pie. It is hard to choose, but the food is reliably good across the board, rarely great, but always substantial – and a bargain, as are the beers, many at $4-$5 a pint. They also offer changing flights of small pours that allow you to sample half a dozen varieties, complete with custom-printed menus and detailed descriptions. Wild game is heavily featured, including this trio of wild boar sliders. It is an appetizer, but if you do not share it is easily a main course. The burgers were the best overall section of the menu, solidly good in all their variations, and the lobster mac and cheese was very rich and creamy, not the best I’ve had but decadent enough. The apps we tried, the sliders and elk sausage, were both quite good, as well as being unique. Overall, the standouts were the desserts, which are as hefty as the main courses, with house-made donut holes rolled in sugar, beer-based homemade gelatos, and especially the fried brownie: One large square brownie dipped in batter, fried and cut on the bias into two triangles, its interior offered the perfect combination of warm ooziness and an integrity hard to find in the burgeoning world of fried desserts, which are often just a gooey mess inside. Amato’s will celebrate its first anniversary next month, on March 31, and has quickly proven very popular with both visitors and locals. It offers lots of choices of food and drink, some quite surprising, representing a true microcosm of Colorado flavors at very fair prices in a pleasant setting with excellent service. It’s not a life changing meal, but it is an excellent way to sample the unique flavors of the Mile High City. What regulars say: “There are a lot of very active people in Denver, athletes, and everyone walks everywhere. Brew pubs and bars here tend to serve big hearty portions for people who love the outdoors,” said Kate Lessman, an executive with the Broomfield-based Vail Resorts ski company and an avid triathlete (she gets a salad). Pilgrimage-worthy? : No, but if you are visiting Denver and want a glimpse into its unique food and beer culture, Amato’s offers great one-stop shopping. Larry Olmsted has been writing about food and travel for more than 15 years. An avid eater and cook, he has attended cooking classes in Italy, judged a BBQ contest and once dined with Julia Child. Follow him on Twitter,@TravelFoodGuy, and if there’s a unique American eatery you think he should visit, send him an e-mail attravel@usatoday.com.